Grown in every shade imaginable, some blue flowers present their blooms in an electric shade of blue, while other blooms are pale blue for a subtle touch to the garden. Many blue flowers are perennial, meaning they come back year after year fuller and healthier, while others are annual or biennial, only living a short period of time before they die. Nestled along a garden bed or border, blue flowers create a showy landscape presence. Blue star (Amsonia tabernaemontana) is a perennial flower with pale blue flowers. Growing 2 to 3 feet tall, blue star is a spring-blooming flower that is striking planted among a garden path or front walkway. The clusters of pale blue flowers on the blue star flower open just under 1-inch long. The heads on the blue star flowers consist of five separate, pointed lobes that attach to the slender tube. The narrow, light green lance- to egg-shaped leaves on the blue star flower grow 2 to 4 inches long and have smooth texture. 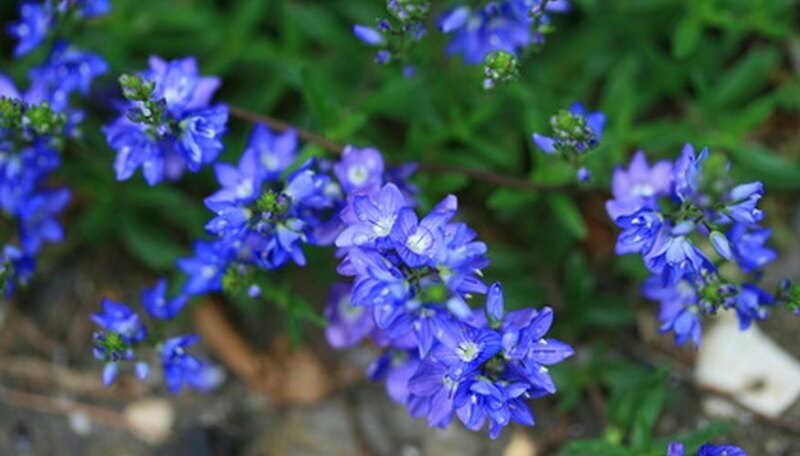 Blue star flowers prefer full sun to partial shade and well-drained and moist soil content. The USDA Hardiness Zone for planting is 3 to 9. Georgia blue Veronica (Veronica umbrosa "Georgia Blue") is a perennial flower that has sky blue flowers that emerge in spring to last into the summer. Growing less than 6 inches tall and spreading 1 to 3 feet wide, Georgia blue Veronica is an ideal flower for growing in containers or as a ground cover in the garden. Deer- and drought-tolerant, Georgia blue Veronica plants have small, dark green leaves that cast a burgundy color in winter. The masses of flowers attract butterflies to the garden for the quintessential garden fell. Low-maintenance, Georgia blue Veronica tolerates a wide range of growing conditions, including overly moist and dry soil. Georgia blue Veronica prefers full sun to part shade and a medium amount of moisture to thrive. The zone for planting is 6 to 8. Bluebird delphinium (Delphinium "Bluebird") plants have a moderate growth rate and electric blue flowers that grow as an annual or biennial. Growing 3 to 6 feet tall and 1 to 3 feet wide, bluebird delphinium have a clump-like growth habit that is ideal planted as the backdrop to a perennial garden or garden wall. Deer-tolerant, bluebird delphinium flowers grow in clusters along tall, erect stems. The white centers of the bluebird delphinium contrast with the blue blooms for a showy garden display. A butterfly and hummingbird attractant, bluebird delphiniums are a classic summer-blooming flower. Bluebird delphinium flowers prefer full sun only and well-drained, nutrient-laden soil and a medium moisture content. The zone for planting is 3 to 7.